The automatic Turbo-Disc sets the new standard for side-stream cooling water filtration. Available in a single-pod model as well as multiple pod models, the Tubo-Disc uses a fraction of the flush water used by traditional sand filters. The Turbo-Disc is effective in removing particulate (sand, sediment, etc.) as well as light airborne contaminants (cottonwood seed, algae, etc. ), both of which are commonly found in cooling water. Model #ATD(1)X2-130mCW-A System is rated at 100 GPM max, requires city water for backflush (40 GPM at 50 PSI min), pump and skid not shown. Model #ATD(4)X6-130m-P500-S6-ACW-A System is rated at 500 GPM max, system backflushed with source water. Improves heat transfer resulting in a reduction in energy cost. Cuts maintenance costs dramatically by decreasing downtime for cleaning and repair. 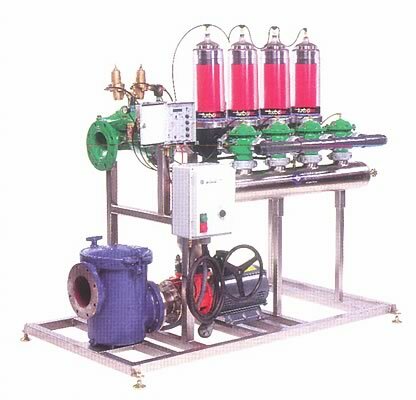 Complements chemical treatment program therefore reduces the cost of water treatment. Increases lifespan of downstream equipment such as heat exchangers, process equipment, ect. Flow Rates for a Single Automatic filter Pod: multiple pods are manifolded for higher flow rates - 2”/100-GPM max per filter pod; 3”/125-GPM max for filter pod (flow rates vary greatly depending on water quality and solids loading). Micron Sizes Available: 100 micron (150-mesh); 130 micron (120-mesh); 200 micron (80-mesh) (centrifugal spinning action increases micron efficiency to 50 micron - results will vary depending on specific gravity of particulate). Pressure Rating: all skid systems are rated to 150 PSI. 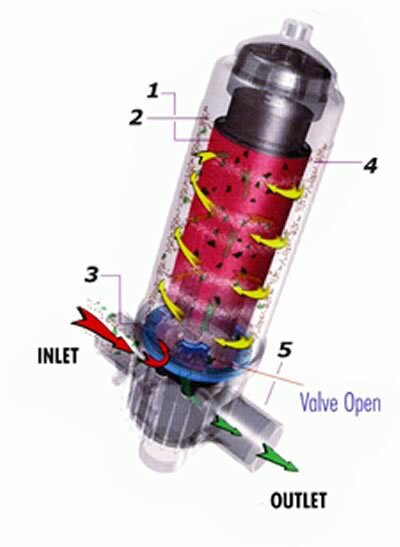 Water enters the inlet and is filtered through the disc stack from the outside to the inside. The discs are compressed by the disc cap on top of the disc stack. 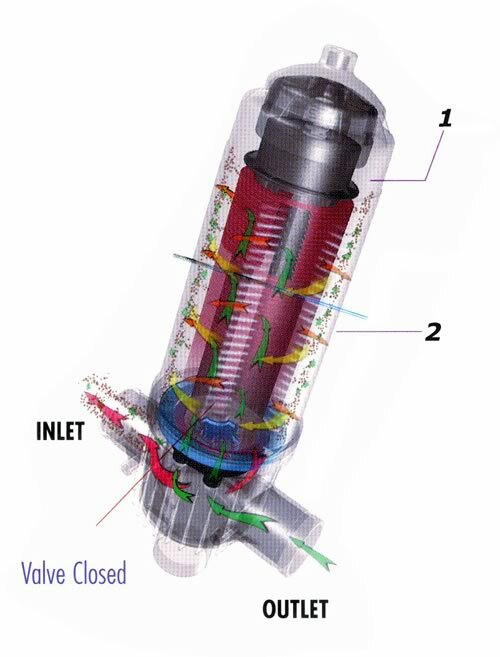 The turbo-element at the base of the cartridge spins the incoming water keeping heavier particulate in suspension and minimizing backflush frequency. Filter debris collects on the exterior of the disc stack and across the depth of the discs. Filtered water exits through the outlet, either in-line or 90 degrees to the inlet. The disc cap lifts hydraulically to decompress the disc stack. A uniform backflush is then applied through the molded spray nozzles centrifugally spinning and spraying the discs clean. Purge water and debris exit through the inlet. When the backflush cycle is complete, the disc cap re-compresses the disc stack and normal filtration is resumed. Would you like to Download FYI #251 to your browser?